On a chilly Friday in October, I met a man with ambitions unlike anyone I have ever met before. Building an aircraft completely by hand from the ground up might not seem so astonishing at first; so marinate on that for just a minute. For 10 years, Jeffrey Faith has owned and traveled by way of a 1947 Cessna 120. This aircraft is fast enough for long distance travel says Mr. Faith, and with clear certainty he states that it is absolutely a blast to fly, nonetheless it bores him. So, in an eager search to rekindle his passion for flight, Jeffrey pursues a mission to once again find the adrenalin in which he seeks. In 1928 Bernard H. Pietenpol designed a homebuilt version of the parasol fixed wing aircraft. The very first prototype became known as the Air Camper and it has proceeded to become an absolute sensation; one of the very first successful homebuilt airplanes ever created. By 1932 Bernard’s success was published in Flying and Gliding magazine, incorporating a step by step manual and reprints provided by the Experimental Aviation Association (EAA) on how to build your own Pietenpol aircraft at home. In the 1920’s, although production throughout the United States was moving quite rapidly, we did not yet have means to make an aircraft from ideal or modern materials that might be seen in production today. The Air Camper was designed with an all wood airframe and it was typically composed of Sitka Spruce with either Birch or Mahogany plywood; this was developed to be considered a “value” aircraft (if you will). One of Bernard H. Pietenpol’s original goals with this airplane was to create a masterpiece that was not only affordable but also easy to construct and original. The Pietenpol Air Camper is not available in a kit; therefore each piece of plywood must be made by hand. As one might imagine, this is certainly no walk in the park. In order to produce an aircraft such as this, basic woodworking skills, hand tools and patience are nothing less than necessary. Originally the Pietenpol Air Camper was designed to be powered by a Ford Model-A automobile engine; however, since 1929 several hundred have been built, and various engines have been procured and used. Due to the design of the aircraft, the Pietenpol Air Camper is typically considered to be “low and slow” with an average cruise speed of 65 mph. In 2010 private pilot Jeffery Faith keeps himself busy and keeps his passion alive by building and producing handmade transportation. This includes a refurbished and modernized 1930’s model truck that he has since sold. This also includes an open-cockpit biplane known as a Ragwing Special. In fact, it was in this very biplane that Mr. Faith first soloed and acquired his license to pilot. He has since sold this masterpiece as well and is in hot pursuit for his next big project. As the pieces of Jeffrey’s puzzle were beginning to fall together he found a copy of the 1932 Flying and Glider Manual Magazine providing the EAA reprints for the Pietenpol Air Camper. Coincidentally, his neighbor had a spare Ford model-A engine; all Jeffrey could do at this point was to give the Pietenpol Air Camper a go. He missed his open-cockpit biplane, so let the games begin! On average, the Pietenpol Air Camper generally tends to take most home builders anywhere from five to ten years to complete. This is primarily due to the time intensive labor that goes hand in hand with this aircraft being entirely handmade. Jeffrey Faith glued the very first ribs of his Pietenpol together on Nov 1 2010 and is now officially in the home stretch of completion; finishing in an astonishing two years. Along with completing his aircraft in such a timely manner, he also did his best to keep his purchases local. Mr. Faith built this aircraft directly out of the magazine and he primarily used the AC4313 FAA handbook as his reference. This was his guide for finding and grading different characteristics of wood and it was because of this book that was able to find wood strong enough for his future fuselage. Generally speaking, the ideal wood of choice would be spruce wood that comes out of Alaska, however, since Mr. Faith chose to go local he was opted out of choosing this particular wood and had to research in order to find a commendable substitute. What he found was Light Popler Douglas Fir and White Fir. Once he had acquired the necessary quantity of wood he used a 100 year old band saw and hand tools to hand carve the propeller. 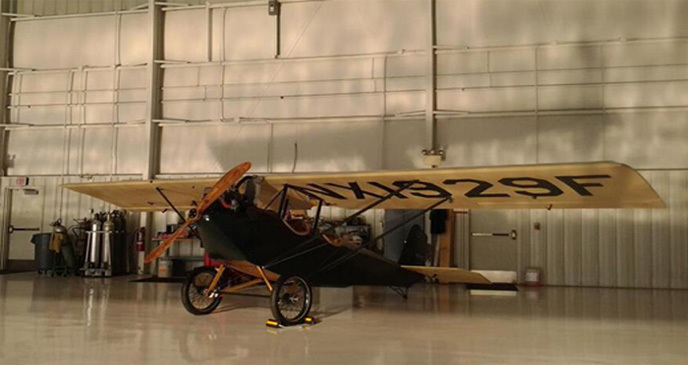 As of October 22, 2012 Jeffrey Faith has completed his aircraft almost entirely. Within the month he plans to receive an FAA regulated inspection as well as airworthiness certificate. Once these mandated regulations have been completed Mr. Faith’s Pietenpol will be complete and ready for takeoff. - Yes he plans to show off his masterpiece! Every year, the weekend before Oshkosh there is an annual Pietenpol fly located in Brodhead WI. This fly in usually incorporates anywhere from fifteen to twenty Pietenpol airplanes along with multiple airplane people who are interested in and fly the Pietenpol aircraft. This just one of Jeffrey’s many plans for the future of his most recent masterpiece. “I call it Piet (Pete)” says Mr. Faith. There you have it fellow pilots, this is the trick! When the Cessna 120 gets boring, build a Pietenpol Air Camper! The best part is, according to Mr. Faith, “contrary to popular belief, there is no black magic involved in the building of the Pietenpol!” So here it is, this is the spark that Mr. Jeffrey Faith has been seeking all along; the same spark that he seeks to revive his passionate flame for flight. To see how very personalized the Pietenpol Air Camper can be visit: Westcoastpiet.com. Mr. Faith says that the coolest part about this aircraft is the originality and the personalization involved. By visiting this website you will get the opportunity to see previously developed Pietenpol aircrafts and view their cosmetic differences such as paint, engines, landing gear, etc. Question to my readers - Rumor has it that the Pietenpol Air Camper handles similarly to a Piper Cub. If you have ever flown in one of these, please let us know! We would love to hear your input! Tori shares her tips on surviving your first Oshkosh AirVenture camping experience.